This is the amazing moment a dachshund expertly sniffs out his owner who returned home from Air Force training after six months away. Romeo waits patiently in the garden while P.J hides in his room, as his Dad films the whole thing. As soon as Romeo is let inside the house, he immediately catches P.J’s scent and goes looking for him. It doesn’t take long for Romeo to sniff P.J out and his reaction when they are reunited is totally adorable. You can't help but smile when you look at a confident Dachshund, proudly carrying his long, muscular body on short legs, his elongated head held high with a bold, intelligent look in his eyes. Because of their almost comical appearance, Dachshunds have long been a favorite subject of cartoonists and toy makers. They are also hard-working and well-appreciated therapy dogs. The Dachshund is a versatile companion. With his variety of sizes, colors, coat types, and personalities, there's a Dachshund to suit almost anyone. 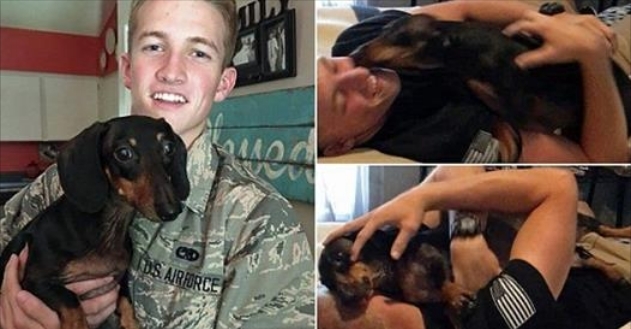 Responses to "Heartwarming moment dachshund is reunited with his airman owner"